Is Adventures in Babysitting Worthy of Being the 100th DCOM? 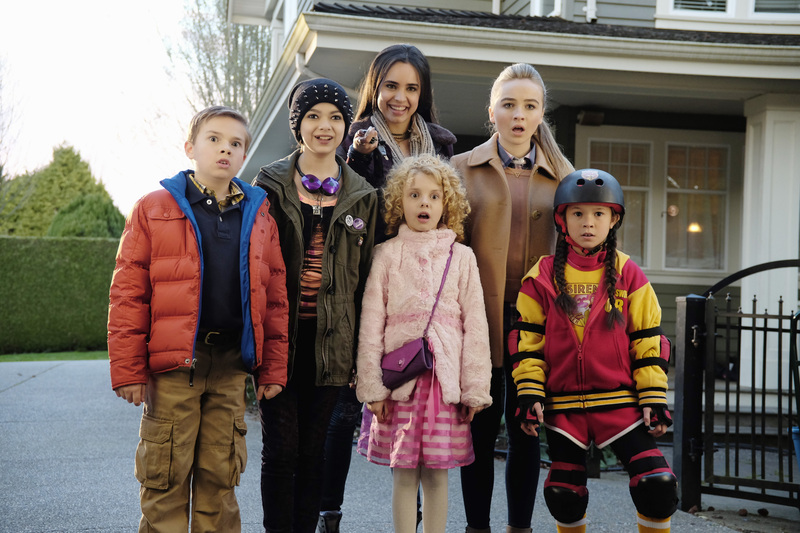 On June 24th, the Disney Channel will air the 100th Disney Channel Original Movie (DCOM) Adventures in Babysitting. It’s a reimagination of the popular 1987 movie starring Elisabeth Shue which also featured stars like Penelope Ann Miller, Bradley Whitford (The West Wing), and Vincent D’Onofrio (Daredevil on Netflix). This version is uniquely its own while still paying homage to the original film. But is it worthy? In the words of my daughter: Best! Movie! Ever! Now I don’t know if I would go THAT far, but we both loved this cute and quirky film that plays as a mix of Ferris Bueller’s Day Off and The Apple Dumpling Gang. Like Ferris, it’s a road trip movie for teens. Stuck in the city after a series of unlikely accidents, the kids have to find their way back and restore everything to normal before their parents find out. Like The Apple Dumpling Gang, it features a couple of bumbling villains who end up chasing the kids around the city to add extra tension to the plot. There are a number of similarities to the original film such as the coat worn by Sabrina Carpenter’s (Girl Meets World) character, Jenny. It looks incredibly like the coat worn by Elisabeth Shue’s character, Chris. Both characters also share the same last name – Parker. And three of the kids they watch have the same last name, too – Anderson. In both movies, the youngest girl meets her hero. In the original, Sara meets a guy she believes to be Thor while in the new movie AJ meets her roller derby idol. Both movies feature a scene where the characters all stumble onto a stage and are made to perform in order to leave. In the original, they have to sing the blues while the newer version has them performing a rap together. And in both movies there is a handsome stranger who stumbles into their lives to help them out. But this new version of Adventures in Babysitting has its own unique twist as well that makes it different and fun. Instead of one babysitter, we have two! Sofia Carson (Descendants) stars as Lola Perez who is about as different from Jenny Parker as two people can be. And there aren’t one group of kids but two. Together, they have to learn to overcome their differences and join forces to unite the kids and defeat the clock to make it back in time before the parents find anything was amiss. Both Samantha and Sofia are excellent in their roles and make the movie lighthearted and fun. And the adventures they embark on have a similar feel to the original movie, but also have their own unique twists and turns. This cute film is definitely worthy of being the 100th DCOM and something the whole family will enjoy. Make sure to tune in to see it, but if you miss it, you can get the digital version the next day and on Tuesday 6/28 it will be available at stores nationwide (along with bloopers and a cute refrigerator magnet and frame that lists all of the babysitting rules). Adventures in Babysitting premieres on the Disney Channel on 6/24 and is available for purchase digitally 6/25 and in stores on 6/28.